“Breaking through your fears while creating the peace and abundance to live the life of your dreams” is the books tagline and underlying message. It will take place from 5:30 p.m. to 8:30 p.m. at Christ Family Church at Tradition Town Hall, 10799 SW Civic Ln, Port St Lucie, FL, 34987. 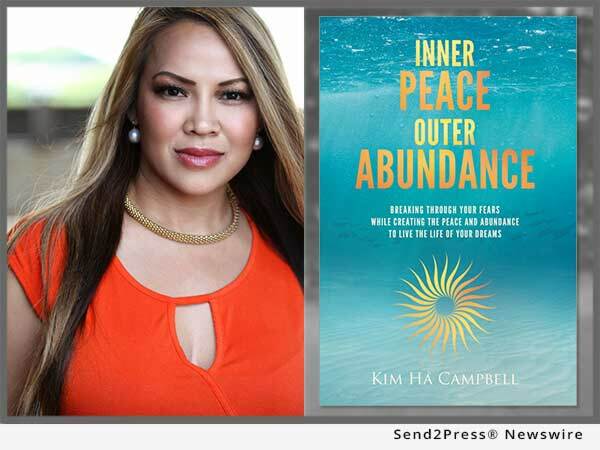 In addition to signing copies of the new book, Kim Ha Campbell will talk about the BEACH Success System and how it is possible to experience Inner Peace and Outer Abundance simultaneously. Kim will also take part in an author Q & A. “Inner Peace Outer Abundance” delivers the best steps and mapping the clearest routes to help yourself, your business sense, and your dreams. Christ Family Church at Tradition and Bonner Mobile Bar are sponsoring this event. To order “Inner Peace Outer Abundance” (ISBN: 978-1457556531, paperback, 6 x 9-inches, 202 pages, $12.95) online from Amazon at: http://a.co/e6RWpRZ. The book is also available in Kindle and Hardcover. Inner Peace Outer Abundance is also available through Dog Ear Publishing, Ingram, Barnes and Noble, IndieBound and numerous other online and physical stores. For more on Kim Ha Campbell coaching, her speaking dates, her book and future events, visit: http://kimhacampbell.com/. To book Tradition Town Hall for your event, seminar, book signing, wedding or other event, visit: https://cfctradition.com/. More about Bonner Mobile Bar at: http://bonnermobilebar.com/. Christ Family Church at Tradition Town Hall is connecting our modern community to the traditional message of Christ. *Photo Caption: Author Kim Ha Campbell. Christ Family Church at Tradition, Florida offers a place for people and families to belong, fit in, make new friends and find an authentic sense of community. Everyone is invited, welcomed, accepted and valued here. Christ Family Church at Tradition is connecting our modern community with the traditional message of Christ.